I applaud Dark Horse’s attempts to collect the numerous Aliens comics in order of publication, but a conflict between Aliens Omnibus Vol. 2 and Aliens Omnibus Vol. 3 made me skip reviewing the second volume for the time being. The last story collected in Omnibus Vol. 2, “Colonial Marines," is a failure of a maxi-series that took two years to publish ten issues (cut down from a twelve-issue run). Over a dozen Aliens, Predator and AVP projects were published in the meantime, including “Rogue," the first mini-series collected in Omnibus Vol. 3. The ending of “Colonial Marines” ultimately tied into the (much better) “Rogue”… but “Colonial Marines” was published in the Omnibus Vol. 2 published before Omnibus Vol. 3 with “Rogue," making the ending of Omnibus Vol. 2 nonsensical. 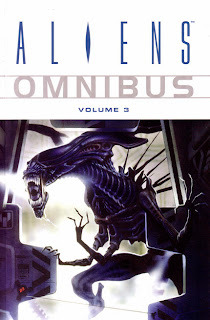 Actually, because the Aliens comics continuity is so loose, it’s easy to just switch the Omnibus numbers and consider this book I’m reviewing the "second volume" instead of the third. After the superlative Aliens Omnibus Vol. 1, the Xenomorphs have infested Earth and rendered it uninhabitable. All of the stories in Omnibus Vol. 3 take place in space and on other planets, as do most stories from this era of the franchise. Corporations still reign supreme now that humans have spread out past any effective form of government. All the same, the films’ Weyland-Yutani still doesn’t appear. Is it because of rights issues, or have they been bought out by another, even greedier and more corrupt corporation? Omnibus Vol. 3 contains seven stories, with three shorts from the Dark Horse Presents anthology closing out the book. The “Advent/Terminus” two-parter is a little dull and hard to read due to weird lettering, but oddly prescient of the first Aliens Vs. Predator film. “Horror Show," set in an insane asylum, definitely needed more time to be developed, as it expands on Mark Verheiden’s ideas of Xenomorph telepathy. Sandwiched between is a unique story, “Reapers," by John Arcudi and Simon Bisley. It’s told without dialogue to let Bisley’s amazing artwork shine. Instead, we watch as the Xenomorphs meet up with a species who literally eats them (well, their eggs) for breakfast. The titular Reapers apparently never made another appearance, which is a shame; I’d love to see them square off against the Predators or even the Engineers/Space Jockeys. Two of the main stories, the aforementioned “Rogue” and also “Labyrinth," are more or less the same story told in different ways. Both feature mad scientists raising Xenomorphs to do their bidding on a remote space station, with a corporation representative and a driven female pilot opposing them. It’s actually eerie how the female pilots look identical; if the creative teams weren’t different, I would’ve guessed that “Labyrinth” was a prequel to “Rogue” with the names changed by the editors. “Rogue” features Ian Edginton, writer of my beloved AVP: Eternal, in his first work for the franchise, joined by Will Simpson on the art. The villainous Ernst Kleist is a delightfully creepy and ruthless antagonist, and I can’t help but love his scheme. He’s able to create docile cloned Xenomorphs, but he can’t create a cloned queen . . . so naturally, he creates an “Alien King” to overthrow a real Queen and take over her hive. It’s hard to make a Xenomorph look “wrong," but Simpson does it (in a good way) with the King due to bizarre mouth tentacles which make it look like a Zoanoid straight out of Bio-Boosted Armor Guyver. “Labyrinth," by Jim Woodring and Killian Plunkett, has sketchier art but an even more intriguing villain. Paul Church is surprisingly sympathetic for a mad scientist, and the detour to tell his origin is actually the highlight of the story. His scheme isn’t as grand as Kleist’s; that might be why he’s far more successful. Plunkett has some of the book’s weaker art, but he does manage to pull off a jump scare in the middle of a comic book, which I didn’t even think was possible. He also draws Church’s origin story on black paper, which enhances that chapter in much the same way as Den Beauvais’ Nightmare Asylum artwork. Speaking of Beauvais, “Sacrifice," which sits between “Rogue” and “Labyrinth," is fully painted, in this case by Paul Johnson, yet another Aliens creator recruited from the pages of 2000 A.D.. Writer Peter Milligan seems to have taken the religious themes of Alien3 as a challenge; he ends out outdoing the film on those grounds. It’s one of two stories in Omnibus 3 which tackle religion, in this case putting a female priest on a distant planet with a Xenomorph out in the forest. You can see the ending coming after a while, but it’s worth reading just for the art, including a protagonist who looks an awful lot like Jesse Tyler Ferguson from Modern Family. The other religion-themed story is “Salvation," which was initially put in a trade form with Sacrifice during the original round of trades. As if to one-up its trade partner, the artwork here is from Mike Mignola, so if you’ve ever wondered what Aliens Vs. Hellboy would look like, now you know. Following the “Rogue”/”Labyrinth” paradigm, “Salvation” is similar to “Sacrifice” in broad strokes. Dave Gibbons spins the tale of a stranded religious man and his struggles with an abusive captain and hostile world. Had the final panel not been a splash page of a silly-looking spaceship with a gigantic and out-of-place cross painted on it, this story could well have been Eisner-nominated. It’s that gorgeous and well-done. There are really only four Aliens plots when you boil it down: alone on a ship, bug hunt, stranded on a planet, and mad scientist scheme. Even the films realized this; they map out to those four basic plots in order. It all comes down to the talents of the creative teams, and in that respect, Aliens Omnibus 3 shines. Next week, I return to Marvel NOW! and Kate Bishop’s other gig in one of the most unique team books from a mainstream publisher. How does Bisley's work look in this edition. I've seen online the original paints and it seems the original publication they halftones his work and colored on top of it. A disgusting thing. I think the original pages were grey scale and they butchered the work in the translation. I wonder if they reprinted with original painted work instead of halftone/color barf.